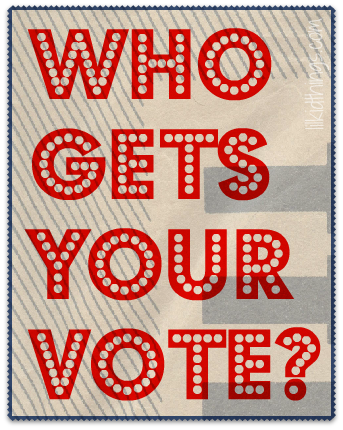 Welcome back to Who Gets your Vote? !! Each Tuesday I will be highlighting at least one reader opinion about the upcoming election. On election day, I will answer these very same questions myself! I am so looking forward to the next few weeks and I hope you are too! The point of this series is to get real people to answer real questions about this election. We aren’t all the same and we don’t vote the same. I happen to think that is ok and welcome opinions that are different than my own. I’d love to see some healthy discussion in the comments as the weeks pass! Would you like to participate? Just email me (andrea at lilkidthings dot com) with the subject line VOTE and include your answers to the below questions. This week’s interview is with Connie of Brain Foggles. Connie supports Obama and has offered to share her reasons why. It’s amazing to me how many different perspectives we all have. I have found this series to be fascinating so far. I hope you are enjoying it too. Thanks so much for taking the time to answer my questions, Connie! Comments welcome! As always, feel free to comment. But remember to be respectful. I know politics can get people excited, but hateful comments WILL be deleted. Bettering the Economy – The President has been and will continue to create more jobs, for example he helped the automotive industry get back on its feet and will continue to grant stimulus money to states to help build roads, etc. which brings in new jobs. Are you a parent? Yes. Why do you think your candidate is the best choice for parents? If undecided – what issues are you concerned about as a parent? All children will have health insurance coverage under the Affordable Healthcare Act, and he has been working on reform of the No Child Left Behind program for public education. His policies for college students increase Pell grant amounts, make it easier to apply for financial aid and has allowed the first $4,000 of a college tuition tax for most Americans. I believe that the future of of our country, economically, environmentally and concerning education will be improved when President Obama is re-elected. Why? He is seen as an “outsider” because of his race. Many people, including right wing proponents, speakers, and people who hold political office use racist code words, such as “foreigner” when talking about the President. Some are blatantly racist. Because of the “birther” conspiracies and the lies about his heritage and religion, many people don’t think he should be president and won’t give him a chance. If you could sum up your candidate in 3 words, what would they be? / OR if undecided – what 3 words would sum up the perfect candidate for you? Practical, Trustworthy, Humanitarian. Thank you for sharing your honest opinions! Such a great series. Loved reading Connie’s perspective! Thank you for sharing my point of view about President Obama.